This Dig-A-Real Shark Tooth Kit contains an authentic 100 million year old shark tooth from the phosphate mines of Morocco. 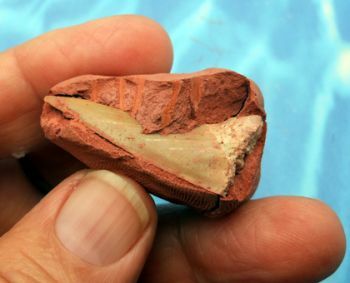 The tooth is encased in a soft matrix that can be chippped and dug away with a paleo probe to uncover a real tooth from the ancient past. 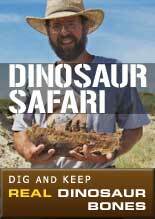 Discover the thrill of discovery just like a real paleontologist. It's fun, educational and best of all you keep what you find. Each kit also contains a color post card that can be used to help identify the kind of tooth in the dig. Sharks are characterized by a cartilaginous skeleton. Sharks also include, skates, rays, and ratfishes. Cartilage is softer than bone and not usually preserved as fossils. Common shark fossils tend to be teeth, scales, and fin spines. Sharks� teeth are continuously replaced from behind, being shed from the jaw during feeding. A typical shark may have 200-300 teeth and shed up to 20,000 teeth over its lifetime. This explains why in some areas shark teeth are so common. 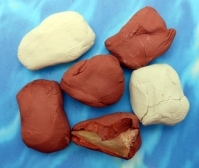 Trace fossils from sharks include spiral forms of coprolites or fossilized feces. Sharks arose in the Devonian Age some 400 million years ago. They soon became the top predators and scavengers of the seas, lakes and rivers. There are many forms and species of sharks. Most are marine but there are a few fresh water varieties. Living sharks range in size from less than 1 foot long to over 20 feet long in the case of the Great White shark Carcharodon caracharocles. Fossil and extinct from also range in size from less than 1 foot to the gigantic 60+ foot Carcharodon megalodon. Megalodon teeth could be up to 7 inches long and come from jaws 7 feet across.